dance.net - stunning sew irish design dress may suit 10-13 years (10242097) - Read article: Ballet, Jazz, Modern, Hip Hop, Tap, Irish, Disco, Twirling, Cheer: Photos, Chat, Games, Jobs, Events! Locked by hummingbird (128773) on 2016-10-05 07:18:25 Sold, thank you for your Mod report. Lovely dress beautifully made by Jillian Howard, Sew Irish designs is now sadly outgrown and for sale after nationals, will be available to try in Hobart if not sold before. 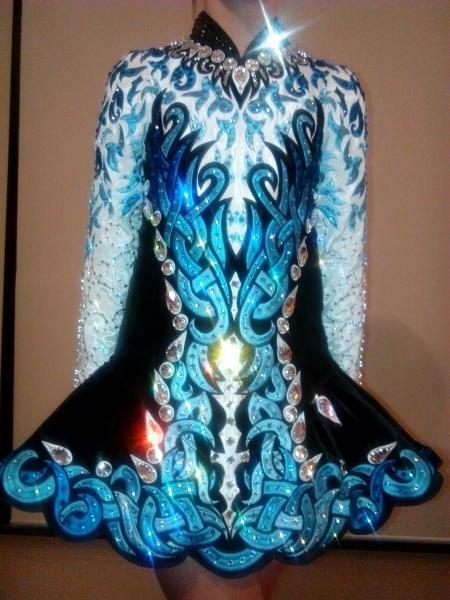 Made for the world championships in March it is encrusted with over 3000 Swarovski crystals and comes with the headpiece and bloomers, always worn with armguards and well looked after it is fully lined for comfort and does have some makeup/tan inside the neck area but is immaculate on the outside with no crystals missing, always checked after each wear. Please PM for price and more details. May suit dancer 10-13 years. Measurements with dress on dancer: Shoulder seam to end of cuff. 22.5in. Front length from middle of v neck to hem. 25.5in Back length from top of zip to hem. 27in. Neck to shoulder seam. 3 in. Bust. 29in Natural Waist. 27in Drop Waist. 31in Hips where skirt flairs. 35in shoulder seam to shoulder seam across top of back. 11in. There is an inch let out in each side seam and the same at the zip it also has darts in the bust area for letout for growth the skirt can also be dropped if needed. Dancers actual measurements without dress on in underwear are...Bust 27.5in. Natural waist 25in. Dropped waist 29in. Hips 32in. This would probably fit our dancer! The only measurement I"m concerned about is the across the back shoulder seam. When I measure my dancer, she is 13 1/2. What is the cost of the dress? What is the return policy? Link for video of the dress to show all of it...www.youtube.com . . . Dress has now been sold thanks.